Standard German originated not as a traditional dialect of a specific region, but as a written language. Learning another language used to be a discouraging task. Not anymore; Learning German Language can direct you to the program that is right for you, whether you want to learn the language for business or pleasure. With today’s audio, video and online instructions it has become easier than ever. These teaching tools have taken the hard work out of mastering a new language. Maybe you decided to go to Germany this coming summer. Which part of the country do you want to see? Maybe it is Bavaria this time, which is one of the oldest states in Europe. It dates back to the 6th century AD. From the middle Ages to the beginning of the 19th century, Bavaria was a powerful Dukedom and it became a Free State in 1918. With its unique diversity, its scenic beauty and unspoiled nature, its romantic castles and medieval towns, Bavaria has no equal. It is one of the prime holiday destinations in Germany, not matter at what time of the year you come to visit. 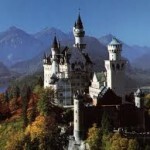 Munich, the state capital is one of the most prosperous cities in Germany. It welcomes thousands of people each October, for its annual Oktoberfest. It began originally at the royal wedding of Crown Prince Ludwig in 1810. The celebration lasted for five days. Today, the festival goes on for 16 days. The city welcomes hundreds of thousands, all ready to hit the beer halls. It is a lively and unforgettable festival. Neuschanstein Castle is something you definitely don’t want to miss. 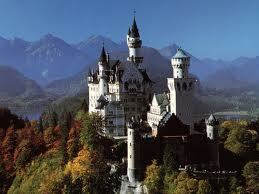 It is Germany’s most famous castle and the model was used by Walt Disney for his Sleeping Beauty Castle. It took hundreds of craftsmen and over 20 years to complete. Ludwig II, the builder of the castle, was known as the Swan King (Schwan in German), hence its name. He was also known as Mad Ludwig, justified or not, and was only 41 years old when he died, but his legend lives on in this wonderful castle. The Romantic Road is a 350 km stunning journey from the River Main to the Alps. It was originally a trade route during the middle ages. Today it offers the traveler one of the most beautiful combinations of scenery, cuisine and ambience that Germany has to offer. Visit the stunning Würzburg Residence Palace, Rothenburg-ob-der Tauber, one of Germany’s remaining medieval cities, remains of the Roman presence in Augburg, and, of course, King Ludwig II’s unforgettable dream castle. All along the Romantic Road you will encounter historic festivals. The Bavarian Forest (Bayerischer Wald), in the south-eastern corner of the state, is one of central Europe’s largest continuous woodland areas. A major part of the forest was declared a National Park in 1970. You will love the rolling hills and tree covered mountains. The two hundred kilometer bicycle routes and the one hundred kilometer cross-country ski route, give the visitors the opportunity to enjoy this wonderful area in both summer and winter. Whatever course you choose, you will be happy to have some understanding of the German language. Even though most young people in Germany speak English; the older generations do not. It’s easy to miss important information when we depend on translations. The German spelling reform of 1996 led to public controversy and considerable dispute. Some state parliaments (Bundesländer) would not accept it (North Rhine Westphalia and Bavaria). The dispute landed at one point in the highest court, which made a short issue of it, claiming that the states had to decide for themselves and that only in schools could the reform be made the official rule—everybody else could continue writing as they had learned it. Where Can You Learn German?